The 18th century poet and essayist Samuel Johnson declared that “He is no wise man who will quit a certainty for an uncertainty.” There would seem to be little room for questioning the soundness of that logic — that is, until one considers just what a dangerous thing absolute certainty can be. In a world where most people will never allow themselves to question that which they believe to be true (a condition hardly limited to religious fundamentalists), the very lack of uncertainty can become an impediment to progress and understanding. With all due respect to Mr. Johnson, he is no wise man who will quit uncertainty for rigid inflexibility on all matters he is certain of. Now that we’ve taken Mr. Johnson to task, it may be time to cut him some slack — after all, he didn’t have to swallow the rationalizations of the Bush administration (even at this late date, Fearless Leader still believes with all his heart and soul that takin’ out Saddam was best for America — and, to be fair, the hundreds of American kids who got shot down or blown up in Iraq might just as easily have died in domestic hunting accidents.) Modern political blunders aside, Johnson might also have amended or qualified his panegyric to the state of unblinking certitude had he lived long enough to cross paths with Sister Aloysius, the central character of John Patrick Shanley’s Doubt and the sort of ironclad dogmatist no 18th century philosopher ever stood a hope in hell of matching swords with. The imperious headmistress of a Bronx parochial school in the mid-1960s, Sister Aloysius is guided in equal measures by an unshakable faith, unswerving adherence to tradition and an unwavering certainty in her own convictions. Ambiguity has no place in her universe, just as there is no likelihood of her budging one fraction of an inch on any firmly held position — and as played by Meryl Streep, it would seem that she is about as open to persuasion as a rhinoceros in full-on charge mode. Come hell or high water, she will trample everything in her path, only later looking back to survey the damage. You can only proceed with such lack of caution — to say nothing of lack of guilt — when you know that you’re right. Adapted from his Pulitzer Prize-winning play of the same name, writer-director Shanley has opened up what essentially existed on the stage as an insular chamber piece to a broader consideration of the national mood at a specific moment in America’s turbulent socio-political history. In the wake of the Kennedy assassination and on the brink of Vietnam, postwar confidence had been eroded to the point that nearly every established truth seemed up for grabs; then, as in now, it was often hard to tell the good guys from the bad guys. Viewed from a certain perspective, Doubt has no heroes or villains to speak of — or, to be accurate, either of the two main characters could exist as both, or as neither. 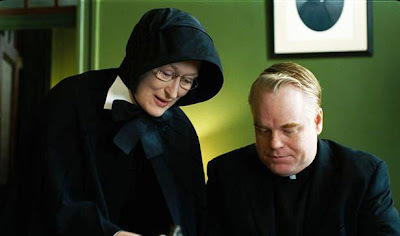 At surface value, the adversarial relationship between Sister Aloysius and Father Flynn (Philip Seymour Hoffman), the young parish priest whose progressive attitudes diverge sharply from Aloysius’ traditionalist views on faith and education, represents generational conflict. On the other, it is also a de facto battle between good and evil, righteousness and hypocrisy, truth and folly — as to which person best represents which values, the playwright isn’t about to say. The guessing game begins with a suspicion — or rather, an uneasy feeling that paves the way for suspicion, and with minimal provocation develops into an accusation. Sister Aloysius’ gut tells her that the popular and charismatic Father Flynn — who relates to the students in a much more informal and personal way than she deems necessary — may be guilty of improper conduct with one or more of the boys in his charge. Without specifying the exact nature of her fears, she instructs her subordinates to be on the lookout for suspicious behavior. When the naïve and impressionable Sister James (Amy Adams) reports an incident of somewhat questionable behavior — perhaps innocent, perhaps not — involving the priest and the school’s only African-American pupil, the grim reaction of Sister Aloysius confirms that she is set on a course from which she will not falter. From this point on, she will broach no contradiction of what she believes to be the truth, and elicit a confession of guilt regardless of what, or who, must be sacrificed in the process. While Shanley has widened his scope to encompass a broader range of themes, Doubt still functions primarily as an actors’ showcase. Long before casting for the film was announced, it was a given that Meryl Streep would be playing the role of Aloysius; I said as much to my theater companion after the curtain had gone down at Manhattan Theater Club, where Doubt began before moving on to an extended engagement on Broadway. Unless she’s dancing across rooftops lip-synching ABBA standards, Streep may be incapable of giving a bad performance; she certainly creates a forceful impression as the implacable Aloysius, and brings the requisite dramatic fire to scenes that couldn’t work in the absence of theatricality. It must be said, however, that she lacks some of the shading and nuance that Cherry Jones, the role’s originator, brought to the part. This Aloysius verges on the monochromatic, with motives that are much more transparent and easier to place — consequently, there’s a bit of an imbalance at work in the Flynn-Aloysius conflict, which in this context can’t avoid feeling a bit one-sided. Jones tempered her austerity with some welcome flashes of humor and spirit — it makes sense, from a dramatic standpoint, for Aloysius to be tightly wound and joyless, but it doesn’t leave as much room for ambiguity, something Doubt requires by its very definition in order to be compelling. This Aloysius seems to be willing to believe the worst about the priest — who becomes a much more sympathetic character than he perhaps ought to be in Philip Seymour Hoffman’s interpretation — because she just flat-out doesn’t like him; that’s what guides her impulses, and makes it difficult for the audience to trust the validity of her positions. Streep is still something to see, though. Even if, to a certain extent, she misses the boat in terms of what the film is actually about, it is nonetheless a smoothly executed, and eminently entertaining performance. Better still is Hoffman, who is in every way superior to Brian F. O’Byrne, the Irish-born actor who played the role on Broadway and couldn’t avoid seeming stiff and oratorical while wrestling with a thick Bronx accent that unleashed itself upon Shanley’s dialogue like a team of attack dogs. If Hoffman makes the character a bit more likable than perhaps he should be — again, it’s easy to know which side to pick in this interpretation — it is a beautifully calibrated, deeply felt performance which makes it very clear why people would be naturally drawn to Father Flynn, and allow him a bit more latitude than is his honest due. Less successful is the very pale, frail-looking Amy Adams, who is all tremulous delicacy as the put-upon Sister James. While it is true that the character becomes something of a pawn in the Aloysius-Flynn power struggle, James needs to come across as something more than a deer caught in the headlights. We never really believe that she has it in her to summon the spirit to stand up to Aloysius; for the most part, she looks as she ought to be shivering on street corners with her big saucer eyes selling matches. Standing up to Aloysius — and Meryl Streep, for that matter — is not a problem for Viola Davis, who brings a vivid combination of toughness and emotionalism to the small but pivotal role of the student’s mother. Perhaps the most marked difference between the stage and film versions of Doubt — and again, part of this can be attributed to Streep’s more dour take on the central role — is that some of the energy and suspense (even, I daresay, the fun) of the original incarnation seems to have been lost in translation. The tone is much darker here than it seemed in the previous context — not in the least because the story takes place under a perpetually gray, drizzling Bronx sky with stern-faced stone angels looking ominously on. Within the confines of a single, contained space — in which the focus seemed limited to the battle-of-the-wills between two shrewd, engaged combatants — there was a crackling energy that the film version doesn’t even really begin to replicate. The impact is further diluted by an opening-up that draws the focus away from the central conflict. Shanley has, perhaps unwisely, added an autobiographical character (introduced to us as the film’s beginning, before any of the other characters have appeared) who was not featured in the play — the story is based on events that actually occurred within the playwright’s childhood, although he’s never said whether or not the real Father Flynn was, in fact, guilty of the crimes with which he was charged. As a director, Shanley doesn’t really have much of a sense of visual style — it’s possible that a more seasoned helmer might have found ways to bring a more varied look to the proceedings, thus avoiding a sense of lugubriousness. That said, the writer’s impulse to protect his vision, without the interference of another party who might try to make Doubt into something a bit more audience-friendly, is understandable. Ultimately, this Doubt is true to its origins, and delivers when it adheres closely to the original script. It is a worthy and interesting cinematic adaptation, even if not quite as successful as it might have been. But of that I can’t be certain. I didn't think Adams was as off as you did, but I liked the film a lot and agree that Streep and Hoffman are the show. All the praise for Davis puzzles me a bit. She's good, but not that good.